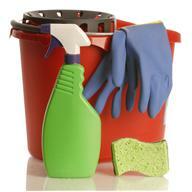 Can house cleaning really be done in 19 minutes? If you have children you will know they can make it messy again in much less time so why not? Professional house cleaners and hotel maids use similar systems to this to get cleaning done quickly but importantly with the most important things never missed. If your home hasn’t been cleaned for sometime then house cleaning will take longer than 19 minutes unfortunately, what the following guide will help you do is to keep a house clean in 19 minutes when you do it every day. Overall though 19 minutes house cleaning every day will mean you spend far less time than if you leave most of your home to be cleaned once a week or even less often. For a start dirt and mess that can be wiped away easily if it has been there for less than 24 hours will become stubborn and ingrained if left for longer and may even stain. No where is this point on wiping the case more clear than with sinks and baths; limescale deposits, grease and soap scum, sometimes when wiping down everyday you won’t even notice you are wiping these up but they will quickly build up if left leaving sparkling sinks and baths looking a dulled mess. The kitchen is a room that should take you only 4 and a half minutes to clean per day if you follow the following check list: wipe down the sink and draining board straight after doing dishes, keeping it constantly clean with about 30 seconds work. Wipe down counters and your stove as soon as you have cooked, it will take a minute for each including rinsing the cloth as food won’t have dried on. Then sweep or vacuum your kitchen floor taking two minutes and preventing the need to mop by stopping dirt getting trodden into the floor. The kitchen is the most time consuming part of house cleaning normally followed by your bathroom, that though need only take 2 minutes. When you wash your hands wash the sink too, use a wipe or even just a sheet of toilet tissue to remove any dirt that has come off of your hands. There’s then no reason why you can’t also wipe over some other items. Wiping your bath, toilet rim, shower screen and mirror will take around a minute. You may also want to use a mist spray and a squeegee on your shower screen and mirror to remove any deposits from water or other mess such as toothpaste specks. The other rooms on your house cleaning list are then a doddle, make a bed in about two minutes, usually less, fold or hang any clothes that have been left out, or put them in the laundry in a further four minutes. 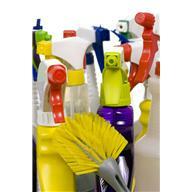 Then go through each room dusting, simply dust on to the floor as next you will need to vacuum. While dusting though straighten out any items such as ornaments, magazines, coasters etc as you go. Lastly on your house cleaning list is vacuuming, if you think vacuuming is time consuming try doing it every day with no built up balls of fluff or trodden in dirt for a pleasant surprise.